There are great many many lighthouses on the California Coast, and this post is just about three of them. Two of these are the tallest on the US West Coast. All three are in pretty locations and are worth stopping by. Point Arena Light is located on Mendocino Coast near Point Arena, about 200 km / 130 miles north of San Francisco. 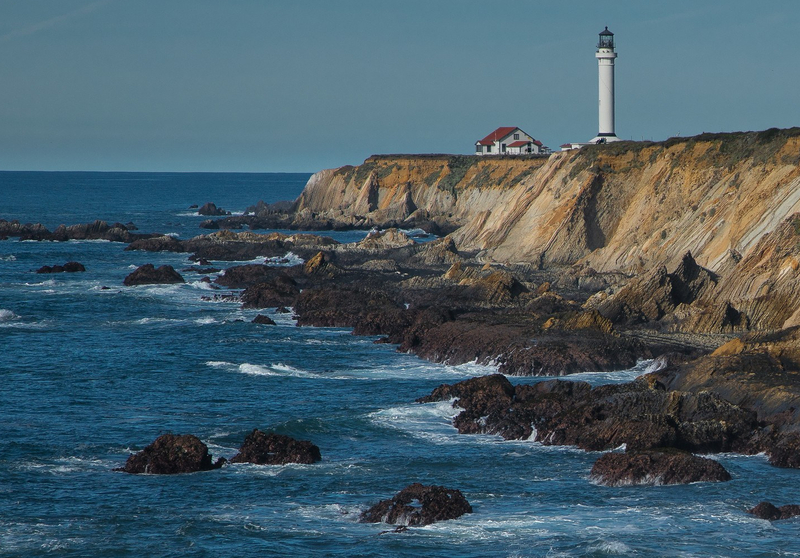 It is one of the two tallest lighthouses on the West Coast of the United States (tied with Pigeon Point Lighthouse, see below). This is not the original structure. The first one, built in 1870, fell victim to the 1906 earthquake and the current lighthouse was rebuilt on its site in 1908. 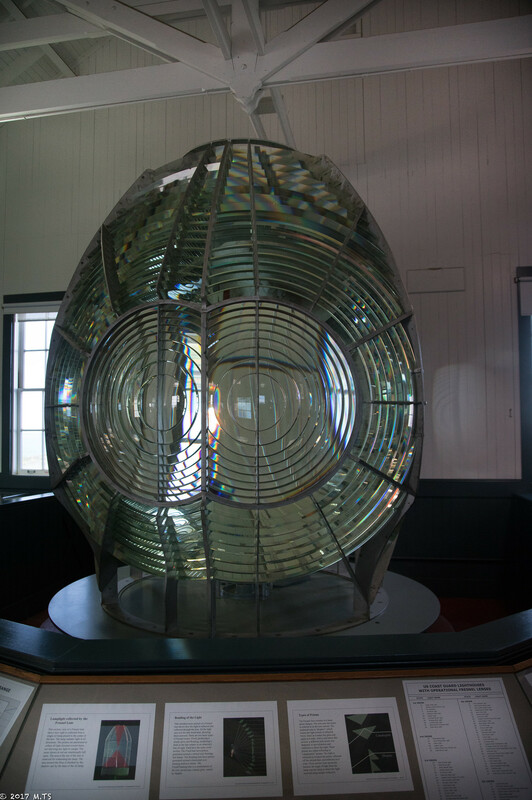 The highlight of the tour is the original six-ton 1st order Fresnel lens that was manufactured in France and consists of several hundredsn hand-crafted glass elements that ensure that the light beam is properly focused. This lens is no longer in use – it was replaced by modern rotating LED lights in the 1990s. During the first years of operation the Fresnel lens was rotated by a wind-up mechanism that was put in motion by the weights, which had to be manually cranked up the shaft by the lightkeeper every hour or so. The light had to be manually refueled with oil. 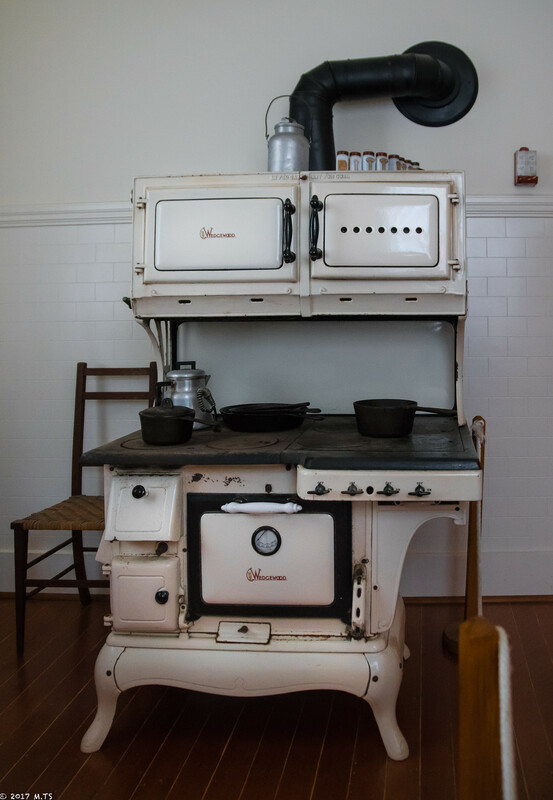 The visitors can sign up for a guided tour that starts in the Fog Signal Building next to the Fresnel lens, and then proceeds to the lighthouse. The visitors climb the spiral staircase to get to the chamber where the light and the lens used to be mounted. The chamber is now empty, since the light that is currently in operation is fairly small and is attached on the outside. The chamber offers a breathtaking 360 degree view, but the glass is somewhat dim and dusty, so for a photo opportunity it is better to use the open balcony that is one level below the top and also provides a 360 degree view. If you’re in a mood for a hike or walk you can find several miles of walking trails south from the lighthouse. From San Francisco drive about 84 miles / 130 km North on US-101, then in Cloverdale take CA-128 East. After about 27 miles / 50 km in Boontville take Mountain View Road. 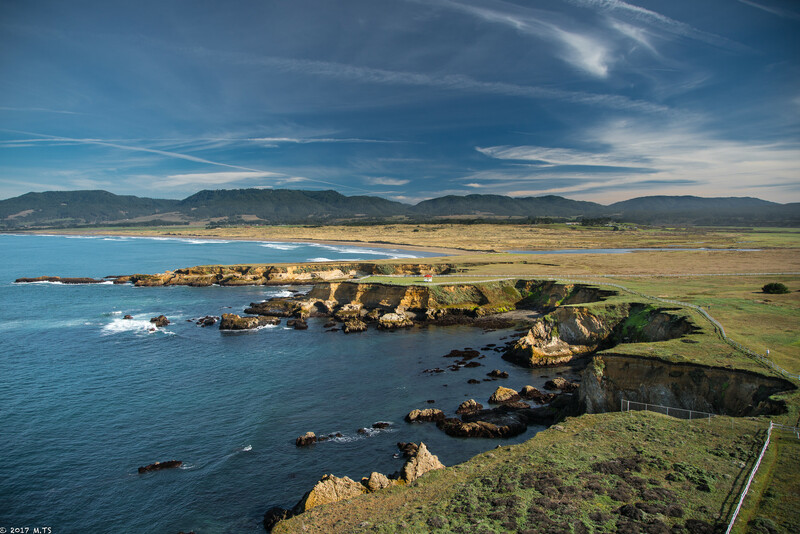 Once you reach Highway 1 turn South and drive about 1.5 mile south, then take the LightHouse Road or simply follow the signs to Point Arena Lightstation. The GPS coordinates are 38.954615, -123.740779. Try Chowder House and Tap Room at Point Arena Fishing Pier. 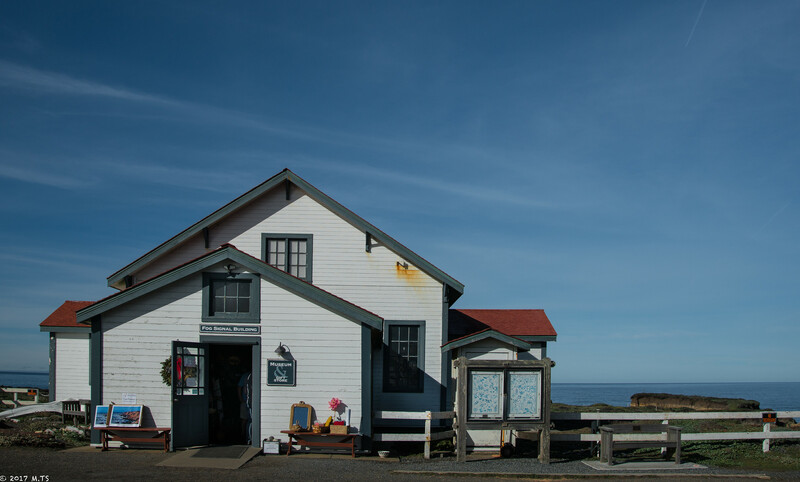 Drive a couple of miles / 3 km South on Highway 1 through the town of Point Arena, then turn West on Port Road toward Point Arena Fishing Pier. Ask for a local catch and/or oysters. Pigeon Point Lighthouse is one of the prettiest and most visited in California. It ties with the Point Arena Light for the tallest lighthouse on the US Pacific Coast. The name Pigeon Point comes from the ship Carrier Pigeon that shipwrecked nearby in the 1850s. 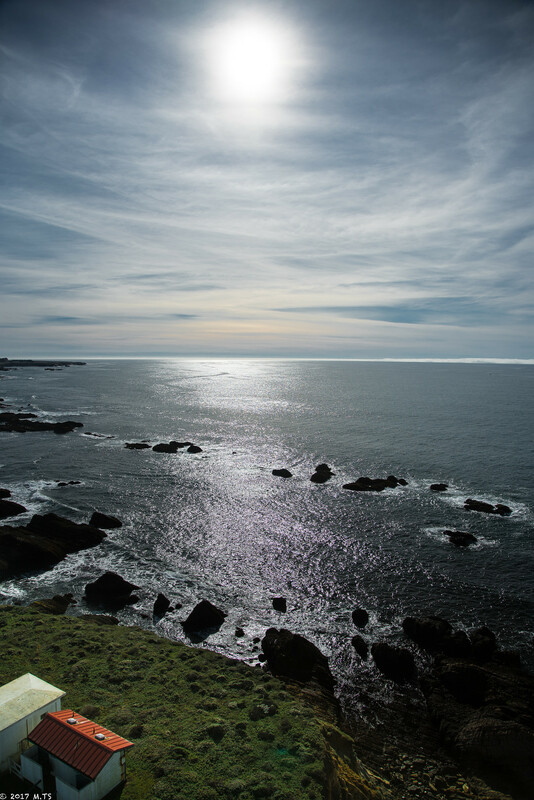 The Lighthouse is located south of Pescadero, on the stretch of coast between San Francisco and Santa Cruz. 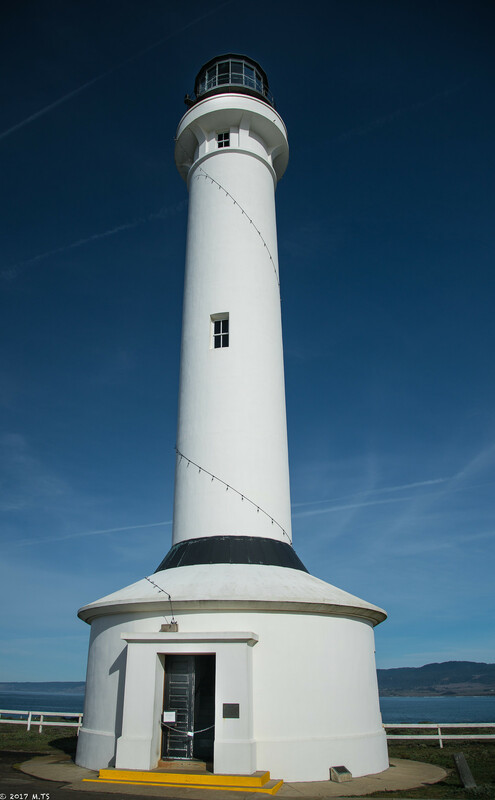 It started operating in 1872, and like the Point Arena Light it used a French-made 1st order Fresnel lens, which was later replaced by a modern light and is now on display in the adjacent Fog Signal Building. 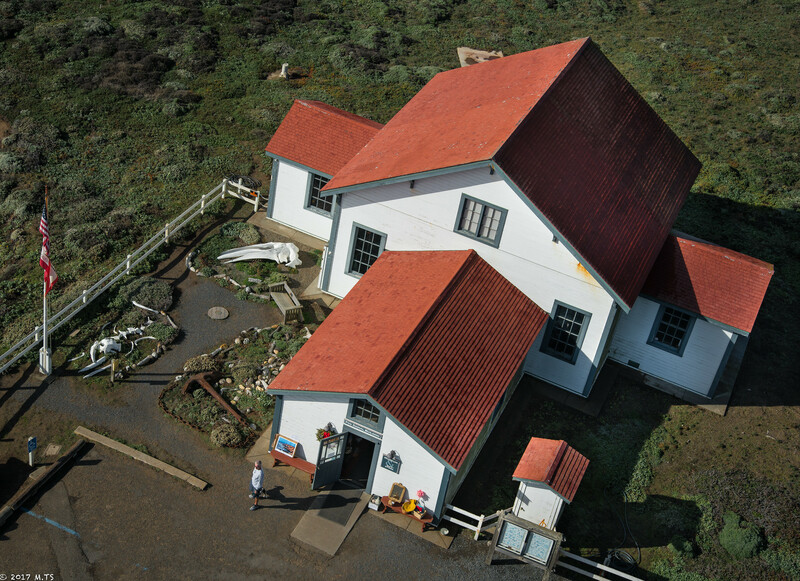 Several single-storey buildings around the lighthouse, including the lightkeepers’ living quarters, were converted to a hostel for travelers, and one of them hosts a gift shop. If driving from the South, try Davenport Roadhouse Restaurant and Inn in Davenport right on Higway 1. Or if heading there from Half Moon Bay, check out the lounge or the dining room at Ritz-Carlton Half Moon Bay. The Point Cabrillo Lighthouse is neither the tallest nor the most visited on the coast of California, but it is very pretty and has several unique features. 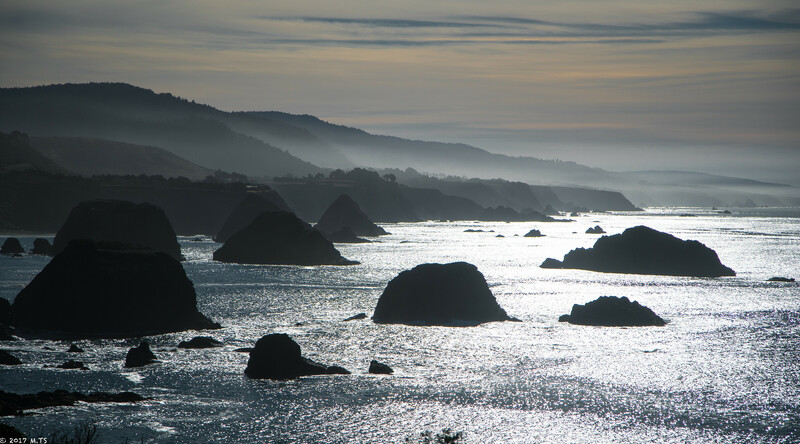 It is located about 1.5 miles / 2.5 km to the north from the town of Mendocino, and can actually be seen from the higher parts of the town. It is part of a Point Cabrillo Light Station State Historic Park. The light itself is only about 30 ft / 10 m about the ground, but being located on a hight coastal headland its elevation above the sea level is actually about 80 ft / 25 m – not as high as the two previous lighthouses, but close. The first thing that makes Point Cabrillo Light different from the other two lighthouses is that its main tower that hosts the light and the fog signal building with its two foghorns facing the sea are part of the same structure. The lens focuses the light into a beam that can be visible to the horizon, and even beyond if the observer is elevated above the see level, e.g. standing on the bridge of the ship. Even in the dense December fog the beam looked strong and could be probably seen at least from a mile / 1.6 km away. 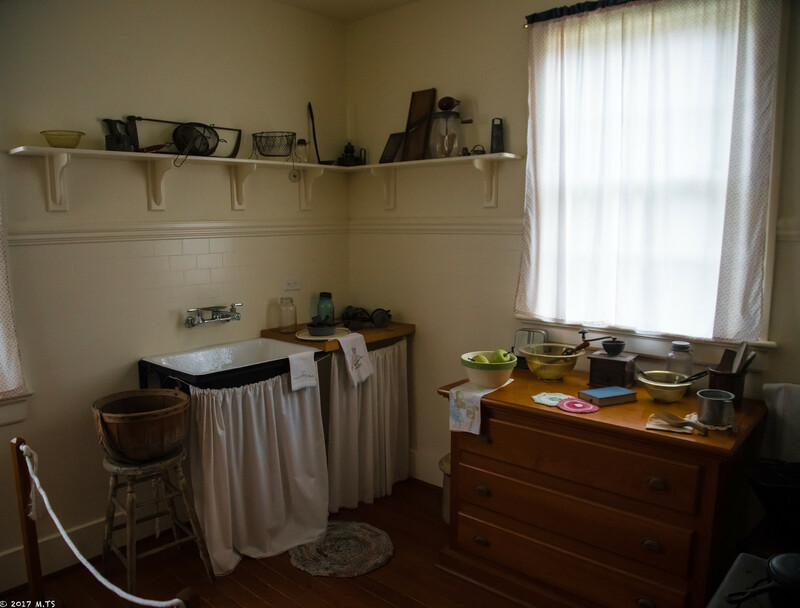 The lightkeeper’s house is now a small museum featuring the original interior and housewares from the early 1900s, along with a few interesting documents and photographs of the first lightkeeper who lived there with his family. The other homes are available as vacation rentals. There are miles of hiking trails in the area, as well as many other places to see around Mendocino – stand by for my future posts. From the town of Mendocino drive about 2 miles / 3km north on Highway 1. Then turn left (west) on Brest Road, then in 50 yards/meters right onto Point Cabrillo Drive, and then in 1.3 miles / 2km left into the parking lot at Lighthouse Road. You’ll have to walk about 0.6 mile / 1 km from the parking lot to the lighthouse. The nearby town of Mendocino has dozens of great restaurants. I would recommend Cafe Beaujolais at 961 Ukiah St., or Trillium Cafe at 10390 Kasten St., both within the historic Mendocino village. If you’re in the Fort Bragg area and are in a mood for some real local seafood then check out Sea Pal Cove at Noyo Harbor (32390 N Harbor Dr, Fort Bragg). Do you know of other lighthouses worth seeing anywhere in the world? If you do, please let me know, and if you have pictures or stories to tell, please share them!